We all love the feeling of awakening that comes with spring. If you want to feel a part of nature even when you’re dressed, Primavera Dress is perfect for you. Light as a breeze it will gently wrap you up in delicate fabric. There’s nothing as beautiful as spring mornings – sun gently warming your skin, dew on the grass under your feet, birds singing and flowers blooming. We all love the feeling of awakening that comes with spring. If you want to feel a part of nature even when you’re dressed, Primavera Dress is perfect for you. Light as a breeze it will gently wrap you up in delicate fabric. 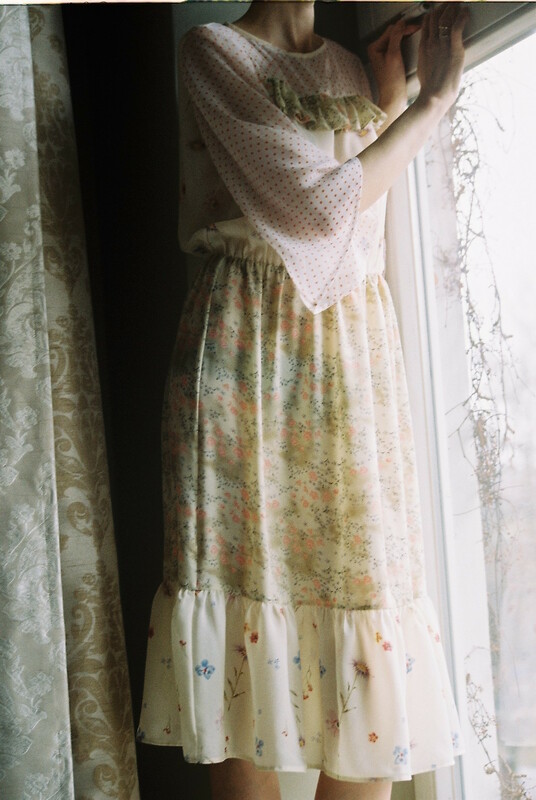 Floral, pastel pattern, delicate dots on wide, translucent sleeves and lovely frills give it a girly charm. Made of high quality viscose it is delicately transparent. Primavera dress can be worn as it is or with a slip, and with skinny jeans it will create a fashionable, modern boho style look. Perfect for hot summer days, it is an excellent choice for every occasion when you want to look feminine but not overdressed. It has a button on the back and loose sleeves for the sensation of maximum freedom and comfort. Dance in it and it will dance with you, showing all your natural beauty.